Welcome, I'm Pouya Kary creator of Arendelle Language, CEO of thepa and executive director at Arendelle Project. A hackerish developer , award-winning designer and a hobby composer. I have developed some technologies in Pa and Arendelle like programming languages, calculation machines, shell layers, text editors, 2D graphics and 2D digram generators, 2D graph systems, encryption methods, developer tools for text processing, one OS and tons of scripts and applets and much more. Now I spend most of my time behind my computers and devices developing my projects, designing their interfaces and writing their documentations while listening to my favorite soundtracks so I very often get the chance to update my own homepage. 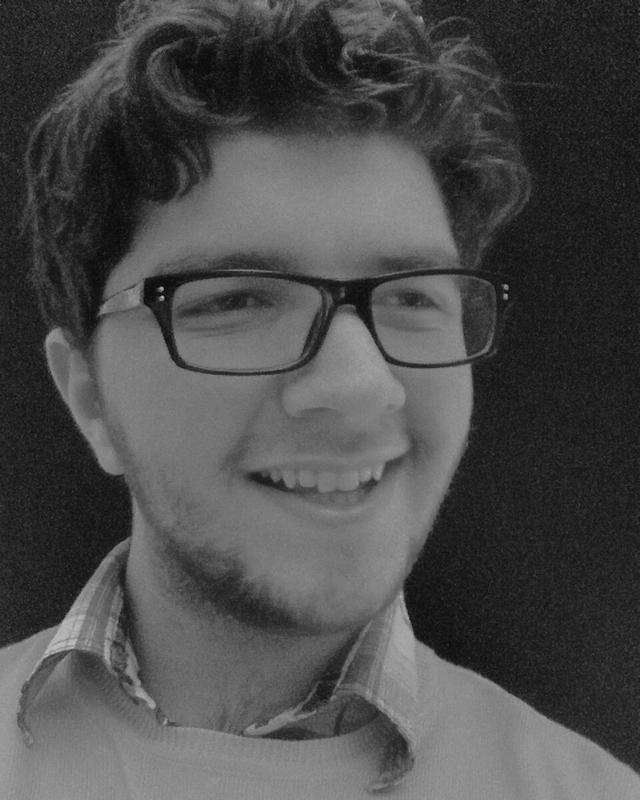 I'm a cross-platform developer worked with GTK+, Kivy and Xamarin to create cross-platform software, I know C,C#,BASIC,Python,Ruby,LUA,Processing and many toy languages like TouchDevelop,CASIO-BASIC,BrainFuck,Shakespeare and I have developed languages myself: Arendelle, Pabbie, Bulda. I have worked with GNU as the maintainer of Gleem, and I have fixed one tiny little bug in Ubunut's shutdown sysetm. Or this right side messaging tool. Please do not contact me if you want to: Ask for help about a thepa's software. We have a very good support system here that is here for you and we have a very goof bug reporting system so please use theps's help page to get in touch with our support system. Do not ask me for help in your computer programs, each value software has it's own team and you must simply ask them to help you fix your problem. Do not send me funny emails and spams. And do not send me Microsoft Windows installable and runable appliacations I will simply remove your email and tag it as a spam. Please understand that I'm buzzy doing many tasks and replaying to your all emails is hard for me it's why I ask you to only send me Importanat emails and stuff. And don't worry if your a fan your always welcome! I'll replay to this kind of messages! You can attach Nexear, PDF, ODF, PNG, JPG, MP3 , MP4, WMA and OGG files too. Have you ever thinked that if your chess board never was 8x8 how many moves it took for a horse to go from one side to the front side? this formula is here to save you! Just input the number of your NxN board and see the wisdom! As I'm a NERD it's too much fun for me to design my own calture, language, types and.... And well people are sometimes intrested like me, So here is a very little amount of my daily tricks and life styles I use to make my self me! "ke'jojdou Nahouii": I speak Nahouii! As I am proudly a Nerd, I use Mr. Spock's words: "Live Long and Prosper" most of the time and I hardly shake my hand with the others, I do believe in High Five and I have no problem using it. I also love the old Egypt kind of greeting. And as I have no believe in God I refuse to use greetings with religiosity roots on them. To make some of my formulas and math works hide and safe I have developed a very cool Numeral System with a very unique type design which makes me able to hide both my numbers and my equations. I may someday share more about this job but for now it's a Kary Top Secret field so I can not say something else! My major projects are thepa's projects these are little applications which I wrote for fun and I just wanted to share them with others. As this applications are really tiny and sometimes useless I had to host them in my own website. So these appliactions are all free / open source / free of charge and cross-platform you can download them all from my GitHub page. For professional users I also included terminal monitoring which lets you monitor every single action of the software just using the terminal. You'll be able to monitor line by line of the code and you'll be able to see how each value changes just like line by line debugging and monitoring process in a professional IDE. Equer is a very special software. There are times when you have a very special equation which you need to solve it with some special parameters and you have to write the whole formula each time into your calculator, It's hard, slow and not so cool... Equer is a machine that generates you a Python program which asks you your parameters and then enter them into your equation and print you the final answer. Easy, fun and fast. To use equer you must read it's manual from it's GitHub page. Textor is my command line text editor. I only designed it to practice console programming and UI design. Textor can read and write files and it can replace texts and... Like all other applications here it's a cross-platform mono app so you can run it in any operation system including all GNU/Linux distributions , Mac OS X and Microsoft Windows. CODIUM. 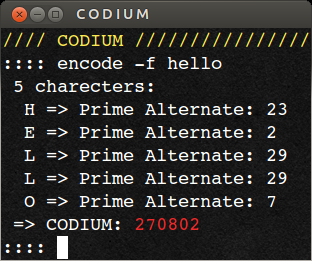 Codium is an encoding/decoding software designed for my coding algorithm called Prime Code which is about giving every single character a unique prime number so buy multiplying this number you'll have a number that if you prime factor it you'll find the character so by anagram studies you'll find words. This version can only encode words not statement and it can not encode large words but I'm working to fix this things in the next version. 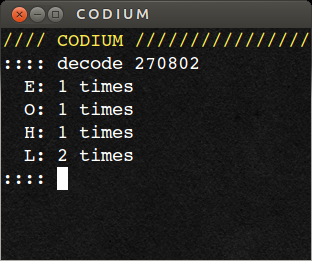 CODIUM is a cross-platform applet too so you can send codium messages to everyone without any worry about their computer's OS. I have a CASIO Prizm (fx-CG10/20) and well I wrote some really tiny codes on it to do some of my ordinary school stuffs and well here is some of them witch may help you. To install them you must extract the files and connect the prizm via a USB cable to your computer, then go to the "Prizm > @MainMem > Programs" and copy the ".g3m" file into it. 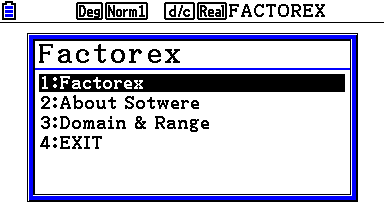 FactorEX is a CASIO-Basic based software to factor prime numbers of a given number. FactorEX is programed with the prime numbers less than 1000 and can't factor prime numbers greater than 1000. There are tests witch are made of 4 choices and you must choose one. In this tests every 3 false answers removes one true. 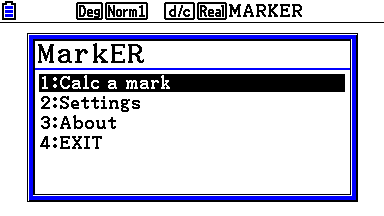 So this is an applet that you can use to calculate your mark at the test. this app comes with a "Settings" button. You may use it to change the number of falses that equals one true. 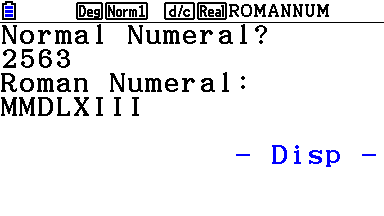 ROMAN is a Roman Numeral Generator. It only generates simple numbers like "XXVIIII" for 29 not "XXIX". I might be able to change it the way it make XXIX from 29 but for now I can't change it. Textmaster is a suite of 3 applets which can render wallpapers from texts for you. I developed this application using Microsoft Research TouchDevelop language. You must install "TouchDevelop" app from Windows Phone's marketplace and then sign in using a Microsoft / Facebook / Yahoo or a Google account and then you must install "Textmaster" from it's bazaar. 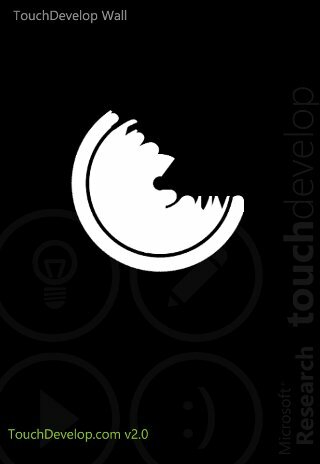 Or you can visit touchdevelop.com from the other devices such as iOS and Android or even your GNU/Linux, Mac OS X and Windows to run the app online. First applet is called "Circler" which helps you make a circle from your text by writing it in all 360 possible degrees! My logo is also a 265 degrees render of Pouya using the original core of circler. 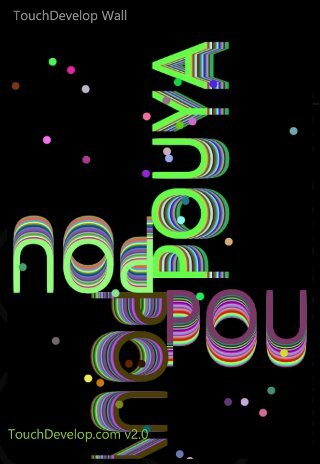 This is a little template, I designed it when I were in car and I think you may like it, Using random colors and random dots you may surprise each time you render your name with it. (c) Copyright 2009-2013 Pouya Mohammad Kary, All right Reserved. Waller, Circler, Starus, TextMaster, Equer, Textor, CODIUM and Binominor are trade marks of Pouya Mohammad Kary, All Right Reserved. This websits's color plate and design is based on Star Trek The Next Generation's LCARS operation system's UI design, LCARS, LCARS Font, LCARS UI Design and Star Trek are copyrights of Paramount Pictures, Inc.